True’s Honorary Unsubscribe the week of May 20 featured Bill Gold, known for being a prolific creator of movie posters. On May 28, the Los Angeles Times — you know, the daily newspaper that covers Hollywood — finally ran an obit for Gold …except that they didn’t even write it themselves: they just re-ran the one that the Washington Post wrote (and published that same day). So this one’s an eye-roller. I’ll use any reliable published source to get my information on interesting people for the H.U. So since they do have to be published already somewhere, I’m not saying True is breaking any big news stories or anything. But when the newspaper of record takes a week to catch up to a guy working out of his spare bedroom, it just points to why so many people have left the subscriber ranks of local news. 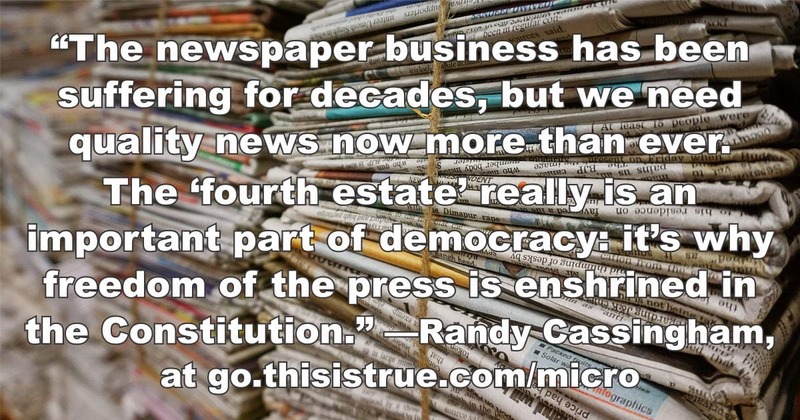 The newspaper business has been suffering for decades, but we need quality news now more than ever. 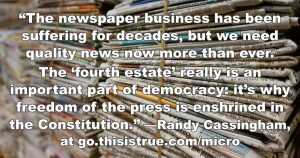 The “fourth estate” really is an important part of democracy: it’s why freedom of the press is enshrined in the Constitution. This all points to an uncomfortable bottom line for newspapers: news is a commodity — it’s why most newspapers haven’t quite figured out how to make money online. There’s a paywall at the XYZ Times keeping me from a story I want to see? Well, there’s a 99 percent chance that I’ll be able to find that news somewhere else — without having to pay $9.99 (and then fight off auto-renewals) for one article. But a good local story? Ah, now that is something that may not be in every news publication on the planet (what’s distance in the Internet age?) — and that’s something people might actually be happy to pay for. What We Really Need is Micropayments. I’m not going to ever pay a newspaper (or, in my case, 100 newspapers) even $5/month to access articles — not when what I really want to see is one article in a publication every 3-33 months. But I’d be fine with a penny or three for an article, even 20 or 30 of them a day to keep up with well-written (and well-edited!) news …which (hey…!) is about the cost of a newspaper. News outlets would be able to get some serious cash in for a really good article, even a penny or few at a time, because they might draw in millions of people to read it for a few pennies. Such a way to make a reasonable transaction has been the missing function online all along, and throwing more and more ads in people’s faces just isn’t the solution: it just leads to ad-blocking wars, prompting an adversarial relationship between publications and the readers they crave. 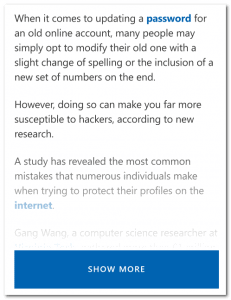 An example of an article that shows the start, then fades out and has a button to continue. We already see the mechanism in place. At least I do, when using my phone or tablet to read articles. On many sites I visit to read an article, the first couple of paragraphs show, then the text fades out and a button shows: [Continue Reading]. It could just as easily say [Continue Reading for 3¢] and — without having to have an account at that publication — it would move that 3¢ from my bank to theirs. The current method — break out your credit card, and then Visa takes 30¢ plus 2.9% off the top — doesn’t cut it for micropayments. Yep: True suffers from this too. Since 1994 I’ve been giving away much more than “a little bit” of its content in hopes that some reasonable fraction of people like it enough to pay a reasonable amount to get more of the well-written, fun, thought-provoking content that they can’t quite get anywhere else. That is what has kept it going for 24 years now (as of the end of this month). Not to mention that extra contributions from readers (you read that right: many pay more than the subscription asking price) has kept all outside ads off True’s web site for more than two years now. But if I could get a penny or two per article, I’d go for that in a heartbeat. How long can I keep this all going? It’s all up to the readers, so we’ll see! But there’s nothing new about trying to figure all of this out. Someone had to start the process, and it’s no surprise newspapers that served the Silicon Valley were at the forefront …and the Chronicle still runs while the Examiner is barely limping along. We march ever forward! YEP! I worked at the Cleveland Plain Dealer for 14 years til I retired 3 years ago! When I first started there circulation was about 600,000 people! When I left it was down to 200,000!! Freedom of the press does NOT mean that they are free to omit or alter the facts. Sadly, some do. I fully support the right to truthful journalism and their right to ask any question without fear of repercussions. But many media outlets spin the facts to support their own biased leanings regardless if it is left OR right. Trying to follow an article of news on websites is too frustrating, like click here, click there, the page constantly shifting up and down, and unrelated content sets itself over news wording making it impossible to read. And don’t dare click on those ads hoping they’ll disappear because they are like a black box and good luck trying to get back to articles. Yahoo is about the worst. “Freedom of the press is enshrined in the Constitution.” YES, but that does not mean the press will be able to survive without the people supporting it. Well Randy, it’s been a little over 20 years since the internet became a commercial undertaking, and in those 20 years — during which everybody knew we needed a way to do micropayments — nobody has yet come up with a reliable one that stuck. You got any ideas? I just myself climbed back on the podcast bandwagon — because Stitcher premium is going to be offering board audio of all 77 Weird Al concerts from this last tour — and I couldn’t help thinking that Stitcher as an organization ought to be providing a tip jar facility where users who particularly enjoy a specific podcast episode could send a tip to the producing organization of a small amount of money $0.50, a buck, two bucks, 5 bucks… like that. This would be another driver for that sort of financial transaction capability. When “got’cha” journalists ask questions intended to create news (Can the President pardon himself?) it just steals time from reporting on important news. A more demanding public will lead to better journalists — but they’ll probably be bloggers. So, back to what I would want. You should be able to get today’s issue online, for as cheap as the paper in a machine. And since it’s online, I think you should be able to say, “I want last Tuesday’s paper.” Pay the cover price. And start reading. And OWN that issue online as long as you maintain your account. Subscriptions should not be the only way to gain access. Not everyone has a spare 30 bucks to read something. But everyone probably has a spare buck to see the current issue. As for single article purchases, that really doesn’t interest me all that much. But for researchers they might do something like that. Or, 5 articles for 50 cents or something along that vein. But, they can’t expire those articles on you. For instance, if you wanted one article on something today, you have your four articles until you use them, the newspaper closes, or you die. And for that they might entice you to spend those four articles by a small blurb email reminding you of those four articles and similar articles or updates to THAT article. (For example, say you bought the article on Joe Blow getting arrested. Then when Joe Blow goes on trial they might send you a link to that article with the blurb, “Joe Blow goes on trial today. Use one of your remaining 4 articles to read it.”) It would allow you to keep up with stories important to you. Subscription to the daily paper physically should automatically give you access to the paper online. It should be easy to claim this privilege online with nothing more than your invoice that permanently links your physical subscription to your online account. My local paper used to have this. When financial constraints forced me to move in with family members, I lost the online access, because there was no need to move my subscription as my family member gets the paper. They don’t access it online. But, the paper no longer has that program. Buying a copy in the machine should give you access online to the articles. There should be a code or something that gives you access to those articles online. You should also be able to “save” that paper you physically bought and go back to it, tomorrow, next week, next year or next decade. Ideally the codes would be short. Yea, it would be difficult to put an individual code in each paper and only let it be used once. But, I have seen it done when I traveled. (The paper was a weekly and each issue had a “mailing label” with the code and web address to use.) If you created an account, you could save the papers. If you didn’t create an account, you could still use the code endlessly. Now, that’s what I would want. What would it take to get me to be a subscriber? You would have to step up your game and give me something for my loyalty. I have some ideas. Give me access to archives while my subscription is active. Maybe limit it to 3, 5, 10 old articles a month with an option to buy others at a reasonable price. Allow me to “follow” articles and get email notifications on updates. Give me the “full” article and not just what fits on the page in the paper. (IE, what you cut for space I get to see online, not what you cut because it couldn’t get verified before publishing.) Update articles with late breaking facts. IE if three hours after you went to print, you verify that there were 7 victims instead of 6, add that to the online article with a note of when it was updated, why, etc. Allow me to setup “searches” for keywords that will bring articles to my attention by email, or ideally chose from several methods of notification that have those words or phrases in them. Give me links to past articles on the same subject right at the bottom of the article. Give me a priority email as a subscriber to submit letters to the editor. It doesn’t have to guarantee that it gets published, just read. Give me access to inside information. For instance, if your reporters regularly pull the police blotter or court docket but only publish an excerpt in the paper due to space, let me see the whole thing. Give me access to a community calendar that your reporters use, public meetings or elections that I might not necessarily notice unless something happens: school board, city council, public commissions, etc. so that I can attend if I want. Allow me to sign up for reminders from you about meetings or elections for these bodies in advance, both scheduled and unscheduled. There are so many ways that newspapers could leverage their relationship instead of trying to turn their information service into some cold calculating business transaction. This would inspire loyalty and provide a platform for them to survive in the information age. But, maybe I just spend too much time thinking about papers. The main point you seem to miss is that (newspapers, at least) ONLY print what their OWNERS want printed. If something doesn’t work for the “boss”, you can bet your bottom dollar it is an article that will not get printed, no matter how newsworthy it is! News used to be news, now it’s ONLY the news the “big bosses” want printed. Kind of a rant, but I hope you see my point. Wish I had an answer to your question, but I am beginning to think it might be a little bit too late for the publishers to listen to anyone but the “board of directors”/”owner” (and no one else). There’s a huge difference between “missing the main point” and not covering every possible point in a short essay. But I don’t agree with your suggestion here: publishers are OFTEN not involved in the day-to-day decisions in what’s covered by their newspapers; the editor in chief is. Bottom line is, someone has to decide: no publication can possibly cover everything. And yep, there will be some ideological influence on those decisions no matter who makes them. That has always been the case, and always will be. Still, if they don’t cover the stories that the readers want to read — and they’ll know about them, because there are a million sites online — then that is information that the readers will use to decide whether to subscribe …or not. And the bottom line is what drives a lot of decisions. Our local paper, the daily “Snooze”, comes with up to 5 online logins per 1 paper subscription per household. Technically, you can also share with a friend because they want to get your friend hooked on the paper version too. However, the scholarship (and even grammar) have fallen so dramatically that it’s rarely worth reading an entire issue. Like John in Arkansas, I do wish you could keep an archive if you were a subscriber. That might motivate me a bit more. Okay, my issues with the newspaper: I’ve gotten the local newspaper for decades, since I moved here. In that time the paper itself has grown smaller (i.e. the pieces of paper they print on), the number of ads has gone up drastically, and far fewer articles are original to our paper. In addition, the price has MORE than doubled over the last 3 years. In the last 2 months or so their delivery person appears to have changed and the new person doesn’t seem to care about their job at all. I’ve had days every week (some weeks 3 days) when I didn’t get the paper at all (or had to call about it), and instead of leaving the paper at my door like they used to, they now leave it wherever. At the bottom of my stairs, on the curb strip, on the street between parked cars… It’s truly amazing how much this person doesn’t care. I live in an apt building in a busy area so just leaving it out somewhere (esp since they are now delivering it later in the day, after I go to work, some days as late as 11 or 12 when I’ve been home on vacation) means random passers by could just run off with it. I have good neighbors who will pick it up and put it at my doorstep inside our building if they see it, but most of them work too. I really want to support the paper, but I don’t like paying double for much less paper and shoddy service. They try to push us to go online, but that is frustrating too. Part of the issue is personal — I spend all day at work looking at a screen so I have no desire to relax with a screen at home. Part of it is that to get articles you have to go online and then find them or click through. There isn’t a way to just see the whole paper as it is in print, or some version of that. Example: on my work breaks I like to read the comics and advice column, which on the physical version of the paper are all on one front-and-back page. Online, reading the comics means going to their comics page and then clicking on each comic strip individually, then waiting for it to load. Maybe this is what they have to do, but it’s a much longer, slower, and less satisfying process then just reading over a sheet of paper which I can do in about a minute. That happens for all the sections, so reading online is so much slower than reading the hard copy.